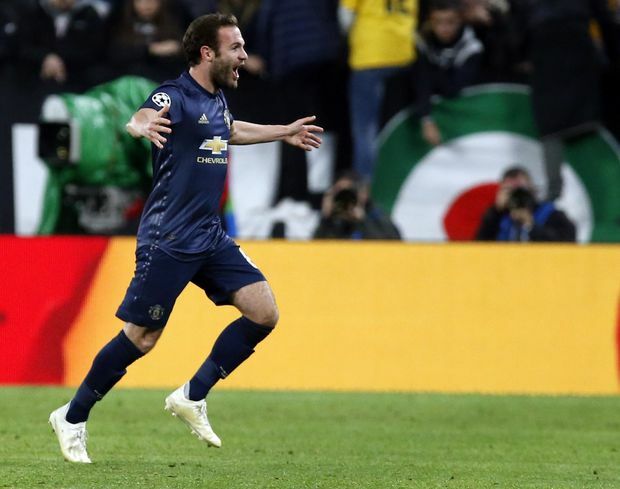 Man United midfielder Juan Mata celebrates after scoring his side's opening goal during the Champions League Group H soccer match between Juventus and Manchester United at the Allianz stadium in Turin, Italy, Wednesday, Nov. 7, 2018. It was Manchester’s night in the Champions League as United stunned Juventus with late goals and City routed Shakhtar Donetsk on Wednesday. Cristiano Ronaldo’s brilliant goal – a volley from a long pass that dropped into his path over his right shoulder – was set to give Juventus a victory against his one-time club with minutes to play in Turin. Man United hit back through Juan Mata’s free kick and a scrambled own-goal from a cross that bounced into the net off two defenders on the line for a 2-1 win. United boss Jose Mourinho, a former Inter Milan coach, taunted home fans after the final whistle by cupping his right hand to his ear, and was confronted by some Juve players. Man City’s 6-0 win over visiting Shakhtar will be remembered most for a comical penalty kick awarded for Raheem Sterling’s fall when kicking the turf in a failed attempt to shoot. Their wins nicely set up a Manchester derby game in the Premier League on Sunday. Real Madrid, Bayern Munich and Roma also won, yet no team joined Barcelona, which advanced to the knockout stage on Tuesday after four rounds of group games. Three-time defending champion Madrid scored four times in the first half at Viktoria Plzen before ending a 5-0 winner for interim coach Santiago Solari. Robert Lewandowski scored both Bayern’s goals in a routine 2-0 win over AEK Athens, which has lost four straight. The grace and power of Ronaldo’s 65th-minute finish, connecting with a floated pass from Leonardo Bonucci, would have been a worthy way for Juventus to extend the last remaining 100-per-cent record. The Italian champion struck the woodwork twice and missed chances to seal the game before United again found a resilient response that seemed to elude Mourinho’s team until recent weeks. Mata curled his shot over the Juve wall in the 86th, and a 90th-minute free kick from the left flank sneaked in off Bonucci and then Alex Sandro. Juve still leads Group H by two points from Man United, and it is two more points back to Valencia, which beat visiting Young Boys 3-1. United can advance by beating Young Boys at home on Nov. 27. Man City’s rough week off the field is not affecting smooth progress on it. The club has been severely criticized in the Football Leaks reports by Germany’s Der Spiegel magazine. City has been portrayed in internal club documents and e-mails as ruthlessly run and allegedly prepared to deceive UEFA to avoid a possible Champions League ban for overspending. City’s clinical six-goal beating of Shakhtar means club officials can expect to return to UEFA headquarters in Switzerland on Dec. 17 for the Round of 16 draw. After David Silva’s opening goal, City’s second was a gift from the UEFA-appointed referee. Raheem Sterling earned a penalty after he stubbed his left foot, untouched by a defender. Gabriel Jesus scored from the spot then, and again in the second half, then sealed his hat trick in stoppage time. City moved three points ahead of Lyon in Group F after the French team wasted a two-goal lead in a 2-2 draw against Hoffenheim. The Germans were down to 10 men when Pavel Kaderabek levelled in stoppage time. Real Madrid and Roma both won in Eastern Europe to remain level on points atop Group G.
Madrid survived an early scare when Czech champion Viktoria Plzen hit the bar, but then scored four goals in a 20-minute span. Karim Benzema scored twice, and Casemiro and Gareth Bale also got goals. Toni Kroos scored in the second half for Madrid. It’s now three straight wins in all competitions for Madrid since coach Julen Lopetegui was fired and Solari took over. In an early kickoff, Roma won 2-1 at CSKA Moscow to move five points clear of the Russian side. Lorenzo Pellegrini scored the winning goal in the 59th, soon after CSKA had Iceland defender Hordur Magnusson sent off. The Group E table has a 1970s feel with Bayern Munich and Ajax looking good to advance. The teams each won a hat trick of European Cup titles from 1971-76. Bayern has a two-point lead over Ajax, which drew 1-1 at Benfica, and both could advance before they meet in Amsterdam on Dec. 12. Ajax next travels to Athens to play AEK, which is one of only two teams with zero points along with Group D’s Lokomotiv Moscow.